All weather family cruising ! New heat exchange and elbow 2018. New engine battery 2018. Self tacking jib. Barton Boomstrut. 12 volt, 3 batteries charged by: engine, shore power 500W inverter. LED cabin lights. Holding tank and pump out. As well as the Eberspacher cabin heating, the boat is fitted with a heat exchange blown air system which works when the engine is running. When I first set foot aboard the then NEW Hunter Pilot at the London Boat Show, circa1996, I was sure that here was a worthy successor to the venerable Westerly Centaur, which I had owned but very recently sold. It seemed to offer all the advantages of the Centaur for family cruising plus a more modern layout and the great luxury of an internal helm for those odd occasions when the weather turns foul! We had seen more than a few of those occasions and the pilot house, Eberspacher heating, hot water etc seemed very appealing, as well as maybe half a knot or so extra performance under sail. That this did not occur was probably down to cost and also change in the fortunes of the British Hunter Brand but in the end somewhere around one hundred of the type were commissioned between 1996 and 2005. Anyway, here we have a very nice, well maintained and equipped example of the same. She is presently in commission and ready to sail on command. 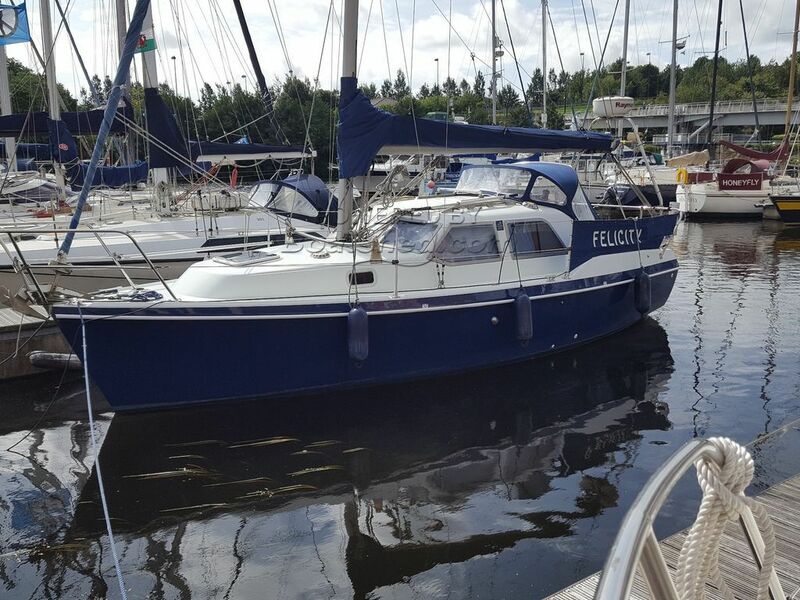 This Hunter Pilot 27 has been personally photographed and viewed by Alan Coy of Boatshed Wales. Click here for contact details.